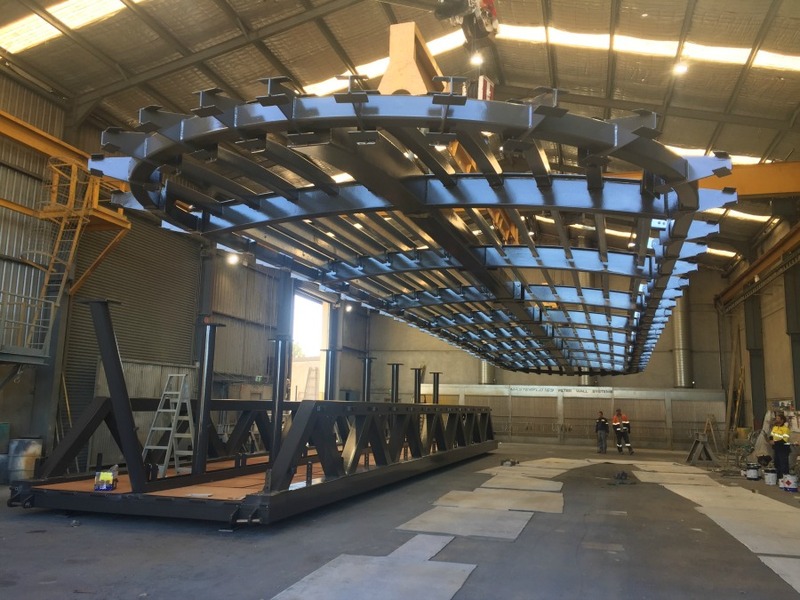 A company that has built its reputation on the fabrication of massively durable major steel structures for public and private infrastructure – including mining, materials handling, oil and gas and waste water projects – is now completing one of its biggest jobs ever for public maritime facilities at the Milsons Point Wharf. TW Woods Construction has manufactured the architecturally formed 26-ton gangway for the new Milson’s Point ferry wharf at the heart of Sydney’s maritime and tourist facilities, where it must withstand an aggressive maritime environment in a busy port while delivering ongoing safety and high load capacity. Tomago-based T.W. Woods is known nationally and internationally for its exceptional metal forming and fabrication of mining and infrastructure capabilities for the mining and energy, oil and gas, water and waste water industries, including rolled steel pressure vessels and giant rail, energy, minerals and coal bulk handling loaders and chute systems. In its latest project involving the 26-ton gangway for the new Milsons Point ferry wharf, just under the Sydney Harbour Bridge, TW Woods worked with Waterway Constructions to develop the new wharf gangway, which will be located near Luna Park and the North Sydney Pool, which are both busy tourist and commuter hot spots. The 24m long and 4.4m wide structure involved complex structural fabrication and profile cutting to form the enormous steel structure, which must absorb high loading weights once installed. The gangway has not only been designed to safeguard the safety of millions of tourists, but also has been designed for longevity in terms of environmental factors, such as the salt water that surrounds a ferry wharf and the varying and vibrating loads that will use it. “The heavy fabrication and quality finish involved in this project are all especially designed to minimise corrosion, since it will be installed in a highly saline and busy industrial environment,” said Mr Woods, whose company has worked closely with Waterway Constructions on several other maritime projects, including the Sydney Harbour Overseas Passenger Terminal upgrade and the new wharves at Mayfield 7 in Newcastle. “For a company that’s typically fabricating large machinery and parts for mining and bulk materials handling, it’s a rewarding challenge to work on construction and infrastructure projects, especially in Sydney’s key tourist and maritime facilities like Milsons Point,” he said. “In turn, this project extends our capacity for private infrastructure projects said Mr Woods, whose company has invested millions of dollars to upgrade its fabrication and metal processing facilities, including cad-cam plate processing facilities, stud welding machine and a plate handling and processing facility serviced by a 10-tonne overhead gantry crane. Facilities also include an 800 sq m paint and blasting facility incorporating a sand blast chamber with 10-metre high ceiling to handle large jobs, feeding directly to a state-of-the-art 720 sq m industrial paint shop with 12m entry door to handle major projects.